Broccoli with Caper-Mustard Sauce | Clare Cooks! Posted on November 5, 2012 by Clare Cooks! I have made this recipe at least once a week for the last month. I’m kind of obsessed with it. Roasted broccoli has quickly become my favorite side dish (sorry brussels sprouts). I love coming up with new combinations for serving roasted broccoli. This is definitely one of my favorites. Capers are totally under utilized if you ask me. I add them into just about every dish possible. They add so much flavor. 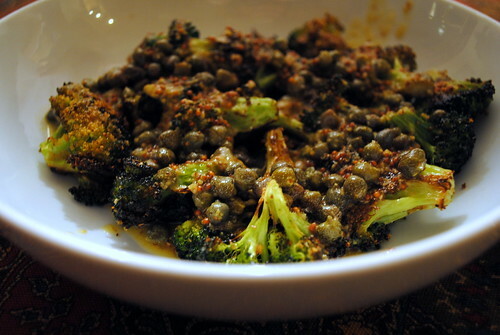 In this dish they really complemented the earthy taste of the roasted broccoli. If you were in a hurry, you could also use this sauce over steamed broccoli, but I really think roasting the broccoli brings much more flavor. Cut the broccoli florets from the thick stalks, leaving an inch or two of stalk attached to the florets, discarding the rest of the stalks. Cut the larger pieces through the base of the head with a small knife, pulling the florets apart. Place the broccoli florets on a sheet pan large enough to hold them in a single layer. Drizzle with olive oil. Sprinkle with the salt and pepper. Roast for 20 to 25 minutes, until crisp-tender and the tips of some of the florets are browned. When broccoli is almost done, in a small saucepan, whisk butter, mustard, and lemon juice over medium heat. Once butter has fully melted and mixture has emulsified, add capers. Pour sauce over the broccoli and serve. Thanks! It really was tasty!